This post is meant as a public service announcement (not meant as legal advice), so, we here at Yucandia will keep the post updated with further understandings and clarifications as they develop. Water, I have tasted it when not brushing my teeth and it is not salty. My meter reads about 1750 ppm which is about 1000 ppm less of what we use to have. But the taste tells me it is it is lower. My meter reads correctly on bottled water about 40ppm so not sure. bookmark this site/thread as I will add pictures and issues from time to time. right now they have the de-sal hooked up to the city water, our water is good but not great, 560 ppm disolved solids. I was told by the workers the plant can do 300 cubic meters per day. that is probably about 1/2 our requirements in the summer and 1/3 when everyone is here. I was told another well will be dug for the desal plant. also they ran a three inch line to all these tanks. here is the first structure being built in the campground by a comercial business. note the total area via the orange markers. second commercial business in the campground. not sure, coffee or taco stand. white building to the right of the gate. the first arroyo to the north of the campground, the new concrete fence with barbwire to stop people from parking there? and lastly here is my suggested air seperation piping to keep water bills low, i have a discussion of it in the water section under building in this forum. still no garbage pick up, may be time to start your own composting systems. right now the people are just dumping in the arroyos now. So time to make preparations for this issue and not have it surprise you. I have heard rumors that it may be February before the city has the money to begin paying all the workers. Time to prepare yourself out the gate so to speak. If people have experience with composting I am starting a thread on this issue to help us out. here is an article about the issue it is in spanish and google translate did not do well with this one..
here is the thread link to post information on composting. Does not show our area is in serious levels, but would not go swimming in todos side right now. via google translate... so not precise. La Paz, Baja California Sur (BCS). In the general population of Baja California Sur, is informed that following the earthquake that originated off the coast of Chile, with a magnitude of 8.3 on the Richter scale are advised to take all precautions necessary to avoid situations that could endanger their safety, it is recommended not navigate from now until after the alert. Similarly avoid jump into the water or being on the edge of the coast, all this in order to not take unnecessary risks. two nice mornings in a row... wow... two nights I just used a fan and no AC. mosquitoes are building as figured. Not many yet.. Yesterday the onshore breeze did help to begin evaporating sitting water. I leave a bunch of spots alone with water as my points of reference to see the evaporation rate, if I do see the mosquitoes wiggling I do empty the location. Looks like we now have about 5 campers in the campground now. wow a really nice and fresh breeze from the mountains. Not humid making this evening really nice, no ac needed. also two more campers in the campground another cabover and a full sized trailer. We are not getting our afternoon onshore breeze that we generally get. This generally evaporates the standing water quickly. Without it it may be a bumper crop of mosquitos. Lots of dragonflies around because of the spaced out rains we have received. really humid too, feels like being in Galveston/Houston TX. No rain so far today, there was some thunder early in the morning.. Clouds in the mountains, clear and humid here.. Yesterday could have been about 1/2 an inch of rain in places. there is a cabover camper in the campground now. oh almost forgot, road report, went to LaPaz yesterday. now there is one very dangerous road hazard coming south to LV. Finally part of the road disappeared, right now it is only about 1 foot in and easily avoided, but if at night you may not see it. So now a final warning that driving the mountain at night south can be critically dangerous. Before just heading north is... Most of the pot holes and such that are horrible are on our side of the mountain going both ways. Also the garbage men have not picked up again for 2.5 weeks. I have been told there is now not even fuel to run the trucks. Before it was the employees had not been paid in months. The rumor is the last politicians that are out of power walked off with some extra money. The rumor I heard also noted there would not be money till February for many of the things. I hope that does not include garbage. so humid again this morning... Humidity back for a week now..
9:30 a weird one, the island was gone this morning, the Pt arena point was clear. and the clouds came our way from the island and we are getting a gentle sprinkle. Generally we get our rains from the south. lost power from noon to 5pm. Got to test out my new used ex-military 2kW diesel generator with 75 hours on it.. This very small one is good for about 6000 hours and are easy to rebuild being one cylinder if I ever put that many hours on. A typical hurricane is 2 weeks no power, about 400 hours. What is also ideal about a small one is low fuel consumption and if the home style batteries like tesla and other are working on ever get reasonable in price this is the ideal size generator to run to keep it charged. With those batteries you would not need to stagger turning on items with motors/compressors like AC, fridges, water pumps. First had to wire it in and fill with more fuel, that took about 2 hours. So next time power goes out will only take me 5 minutes. Was able to run everything except the 1 HP water pump (unplugged it) and Air Conditioner units (turned circuit breakers off). I will have to test my smaller AC unit later Ran all outlets and what was plugged into them including 3 large fridges, what I do is stagger the turning on the fridges because the compressors have a high peak demand, so turn one on and wait 5 minutes. I was at just under 70 percent capacity, so next will test my small Ac unit later. It draws 4 amps and shoud put me at 95% usage which is ideal. To run the water I have a small RV 110vac shurflo water pump, these are very low amp demand and have a auto pressure shutoff, not a lot of waterflow but enough to wash dishes and take shower like you were on a boat or RV. Also these are built such that our salty city water does not corrode them. lots of flying bugs last night, specially the termites. Sophia said this morning she was actually cool, not cold. This morning not as humid, strange considering the concrete and sand is wet. we just had a 20 minute downpour of rain, may not have hit el sargento. It was about 1/4 inch in that time that caused moving surface water. noon; the patchy rain did not amount to much, but now we have full coverage clouds and we are getting a decent soaking rain, not heavy but soaking. 6pm, we only had about 30 minutes of moderate rain, no run off. Hurricane Linda is giving us some really humid weather. Note though we have had some rain we still do not have weeds popping up all over. Also the bobos have not been a major issue so far. We have had dragonflies off and on all summer may be the reason. No other major issues with bugs. Last year it was a war with ants all summer, this summer have not had to even put out bait for them. I found a crack in my neighbors septic tank in the spring and have been putting in mineral oil which has eliminated all mosquitos in my location. I put in about 1 once every 2 months. Once it cools off I will reseal their tank. If driving down I would recommend buying a gallon of mineral oil from amazon, about $20.00 it is usable for many things in addition to stopping mosquitos breed in pools, tires, other open water things like fence posts. I presently have no mosquitoes where last year was killing 10 a day with a fly swatter because of my neighbors crack in his septic tank. ROAD REPORT Just a heads up, the road over the mountain is in very bad shape, would not drive it at night but if you do have a few extra tires. And extra shocks. Well maybe just go real slow. Going south is just real pot holed up and if going slow no death defying issues.. Going north, if you had not been on it absolutely do not drive it at night. Northbound there are about three places, well one is marked now that you can disappear off the road down the mountain say headlights were in your eyes. Also cows are really out in force. If we get more rain during the peak next couple weeks I will note the details on this section of my website. rain went to west of LaPaz. The trailer in the campground is now gone. the road over the mountain is in pot hole shape. All vados be on the look for sand with washboard even coming down the mountain. It is safe going south if you do not go fast and if you are not driving at night. I would not suggest driving it at night at this point. And going North there are 2-3 extremely dangerous parts that are life threatening. None are marked well. One is so hazardous that if you hit it going fast when there is a car coming you are falling off a cliff. It is around a bend and hidden because it is at the bottom vado. We are getting light rain today as of 4:30pm. most thunder I have ever heard down here.... started at 2 and been booming away for 1.5 hous with now threatening us with some rain. obviously lots of lightning. we then had about 20 minutes of rain, maybe about 1/8 inch. also as a side note the below picture in the next post (if not logged in you may not be able to see pictures) , I just walked across the border to fly back to LaPaz. I went through the mexican lane because I have a valid tourist visa already. Had read that we can do this with a in place visa. There was no line at any of the lanes but wanted to try this. They did not even ask me to show my FMM visa or passport. Had been told there are a few lines at this part before. After you pass by the immigration part there is the standard customs section. I did not hit the red light at the button but because I had two large bags, they sent me to have it x-rayed and then I was about to have it hand searched but the scanner guy told them it had nothing so they did not do the hand inspection. But note they do this now at this port of entry. The other part at chapperal has been doing this to bus people since it opened, they even scan the bus itself after everyone departs. So strange it was raining this morning (normal in the summer is unless it is a hurricane we may get a cloud in the afternoon coming from the mountains to our south) and it is still summer and no hurricane is causing it.. Not hard but consistent and a soaker maybe 1/8 of an inch. This should cause some weed growth and greening of our town finally. New walkway at Otay Mesa. Rumored if you have a valid visa like even the FMM you can take the mexicans walkway. I will be testing this friday. all clear and very humid. because of the clouds it was such a cool day yesterday but humid. but in our comfort zone. it is raining right now, rain coming from the north. 9am. light rain drops that could get heavy. update, noon.... the gentle rain stopped after about 1.5 hours. While it was never heavy in this part of town it was a decent soaking rain. Bugs have been getting bad lately because of the rains that are not hitting here? So with one hitting here I can only imagine. Read in LaPaz that the garbage men are on strike again. Last one a month or so ago it was about 6 weeks before our garbage was picked up. nice weather right now... nicest days I can remember in the summer, we have clouds. a few drips of rain tonight. also this is probably the most kitable summer we have ever had, if you have a large kite... other summers even a large kite would not have done you a favor. The city water pump must be out in the pig farm, that is what I have heard second hand. We have water though and it is sitting at about 80ppm dissolved solids. So the water coming in must be los planes water right now. When you take a shower the soap actually lathers. we have just has a few days of not so humid weather like we use to years ago. What a relief. at 3pm we had thunder and lightning closing in on us. did not hit us but the valley most likely got a bunch, the final arroyo after town after the graveyard flooded and only high clearance should venture. well when I got back from taking that picture as I walked outside after uploading it here is what I found on my step. 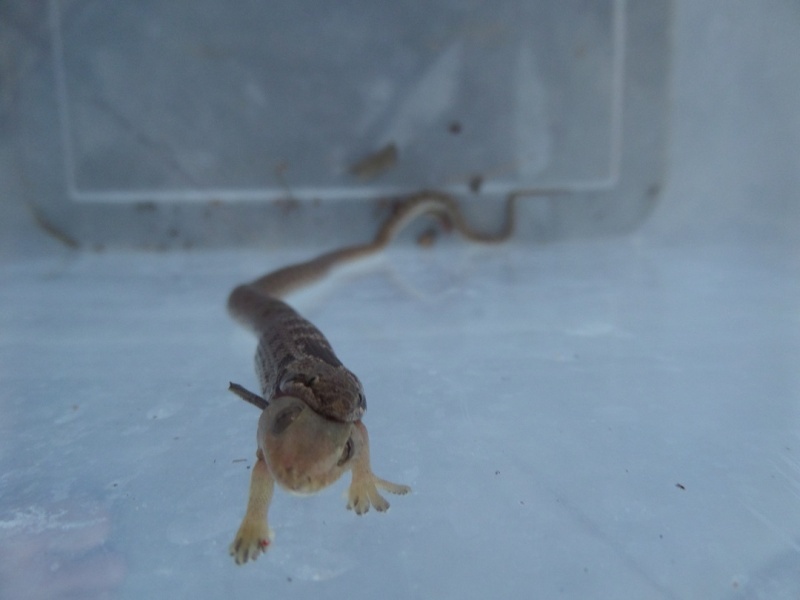 A gecko who has had better days.. So pushed them into a container I use for my turtles. Contaminated Mexican Cilantro Sickens Hundreds Across the U.S.
Cyclosporiasis, a painful and uncomfortable parasitical stomach ailment, has affected more than 380 people in 26 states after a batch of Mexican cilantro was found to be contaminated with human waste, the Centers for Disease Control and FDA says. According to the two federal agencies, the outbreak began on May 1 and is likely caused by "contact with the parasite shed from the intestinal tract of humans" in the fields where contaminated cilantro plants were grown in Mexico's Puebla state, al-Jazeera America reports. The news comes after the FDA placed a partial ban on cilantro from the region in late July. Authorities investigated up to 11 farms and found toilet paper and feces in many of the fields. They also found that many of these farms lacked adequate toilet facilities, AJAM says. According to AJAM, it's not the first time cilantro from Mexico's Puebla state has caused widespread illness. The herb has been linked to outbreaks of the stomach condition in 2012, 2013 and 2014 as well. humid overcast electric was out since i think 2-3am till noon today. I could see a fuse triggered that needed resetting at the transformer but CFE did not come out here till late morning. raining right now, just a little drip or two. much up in San antonio.. this is typical in the summer... with thunder and lightning. about every 3 days or so. The story of a gold mine project in Baja California Sur took a strange twist yesterday when a La Paz municipal director tearfully explained she had been pressured into granting an approval for the controversial mine. The director of urban and ecological development, challenged by mine opponents to explain why she had signed off on a land-use change to permit the Los Cardones mine to go ahead, said she had been harassed into doing so. Members of the Citizens’ Front in Defense of Water and Life visited Socorro Icela Fiol Manríquez in her office yesterday morning after hearing the municipality was moving ahead with approvals for the mine. She claimed that municipal general secretary Marco Antonio Núñez Rosas had pressured her into signing, but told mine protesters and reporters she intended to revoke that approval. Today it was reported that both Núñez Rosas and Fiol Manríquez have since met with the Citizens’ Front, where the former said that no mines have been granted any authorizations for land-use change. via google translate so exact meaning is not good. Within weeks the XIV City of La Paz, through the Department of Urban Development and Ecology, will grant the Change Land Use in favor of the mining company Los Cardones for it to start operations with gold mining in the village San Antonio, Baja California Sur. According to information obtained, the Ministry of Environment and Natural Resources (Semarnat) granted the Environmental Impact Statement (EIS) for the mining company, document through which it is disclosed, based on studies, a significant environmental impact and potential to generate a work or activity and how to avoid or mitigate it in case it is negative. Also, the Ministry of Economy granted the necessary permits to the company -The Cardones for the start of its work, but only remains for the City of La Paz XIV concrete Change of Land Use, which no longer depends on the vote the Cabildo. The data collected show that the final decision to approve the mining project is in the Urban Development and Ecology, and an estimated 90 percent chance of obtaining the endorsement of the authority based on the law. "They requested the Change Land Use since March, and that is to be resolved, and if you press me, it will be in favor of the mining company because we have no legal grounds to prevent the start of operations [...] If we deny Land use change, they put an injunction, they go to a jurisprudence and beat us, "said our source. The Land Use Change mining company is to perform pull dam, the construction of a desalination plant, a pipeline to the sea for discarding the water used, the lifting power lines and access roads. Apparently citizen demonstrations against this mining project, considered toxic, had no echo in the authorities, who claim that the process has been conducted right attached to respecting and taking positions in favor and against. ended in 30 minutes it varied around town how much we got as usual. I think here about quarter of an inch. On 7/15/15 we drove on the new road from the SJD airport to Todos Santos. The road takes you to north of Cabo just before where hwy 19 turns north running parallel to the pacific. Must've shaved off 1/2 the time...hardly anyone on the road so I'm thinking it had just opened. Will time it on return. No tolls yet but toll booths set up. In two locations locals set up orange cones to block passage...they are protesting not being paid for their land is what I read later. We were able to drive through a narrow part of the cones but a lady was standing real close where you have to be careful not to drive over her toes . 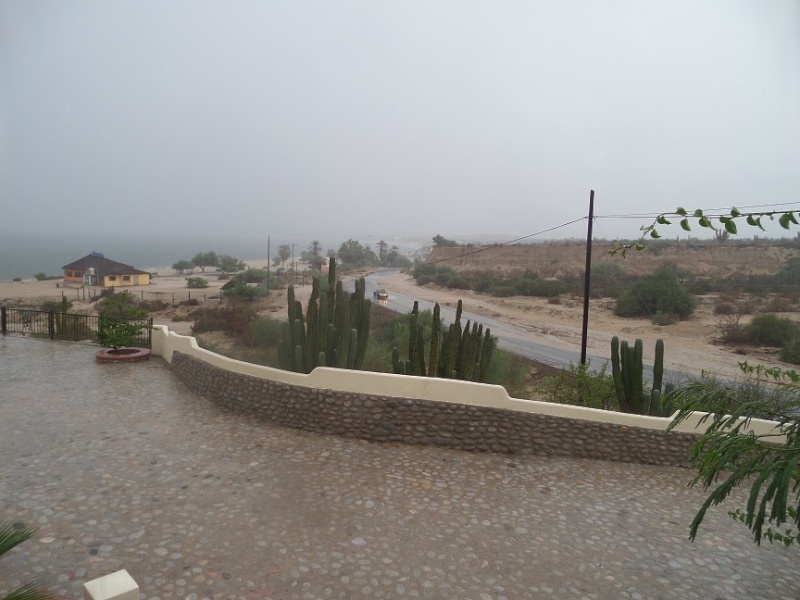 We have not received the rain other pats of baja are getting, san antonio and El triunfo were the winners so this goes into the valleys water supply. 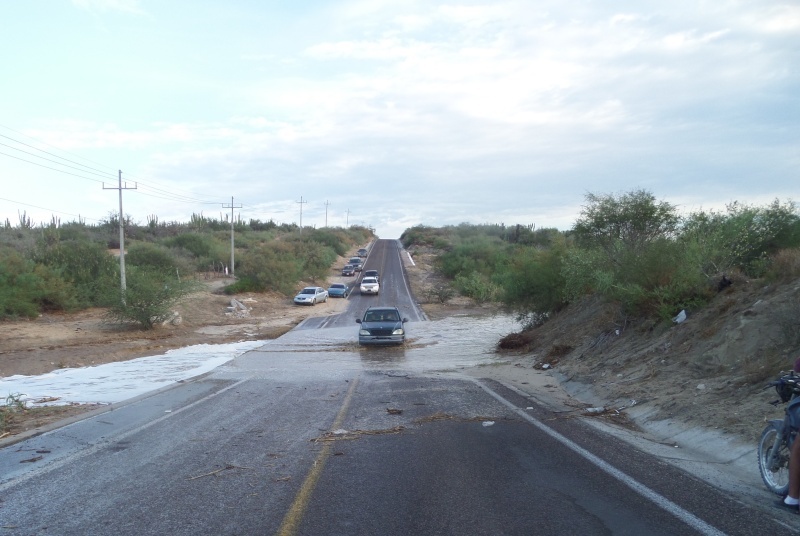 n the report this morning, Conagua discloses the amounts of rain on Wednesday, with El Triunfo where more water fell, registering 139 millimeters. Followers: San Antoni or 44.8; Ciudad Constitucion, 28.6; La Palmilla, 19.3; The Cajoncito, 13.5; The Plum, 12; San Pedro, 8; La Paz, 5.3; La Ribera, 5.2; Todos Santos, 5.2; Plans, 4; Cabo San Lucas, 2.5; and El Quemado 1 mm. 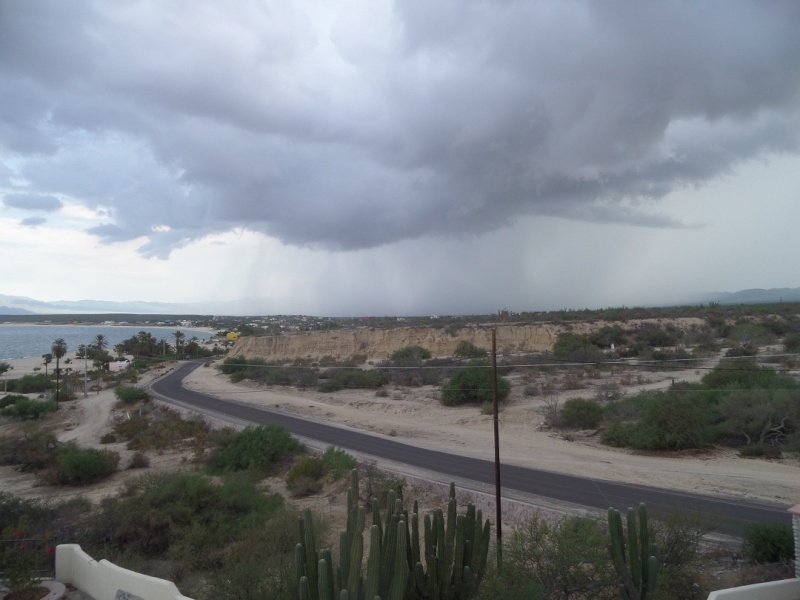 The chances of rainfall persist today, with 60% chance of rain for the municipality of Loreto and Comondú; 50% for Los Cabos and La Paz (in the state capital formation of afternoon thunderstorms and scattered rain showers are expected); Santa Rosalia 40% and 20% for Black Warrior. Also new equipment has arrived for emergency response to baja. This will really make a huge difference, trucks to get the generators out to the areas hit, a crane to lift the generators in place and 13 generators. A few drops of rain today, did make the cement wet for a bit. also posting on the hurricane on the hurricane section. the below is 60% effective. There’s a vaccine on the way for dengue fever after a signing ceremony in France yesterday, but there’s nothing on the horizon for another mosquito-borne virus that has spread quickly in Mexico. This country is on track to be one of the first countries in the world to implement dengue vaccinations following the signing of an agreement between the Health Secretariat and drug maker Sanofi Pasteur. Clinical trials of a drug designed to combat what has been described as the world’s fastest-growing tropical disease wrapped up last September, when it was announced that Mexico would probably be one of the first recipients. A Sanofi Pasteur official said in June that the company was ready to distribute the drug, it having proved effective against the four types of dengue. Mexico was one of countries to participate in the trials, which began in 2004 and took 10 years to complete. hurricane Delores is coming... I will post in the hurricanes section as we have effects with pictures. In Baja California Sur there are 15,000 illegal US, he announced the delegate of the National Migration Institute (INM) in the state, Alvaro de la Peña Angulo. The official called on foreigners to legalize their stay in the state through the Immigration Program Temporary Regulation. "What we know is that they are here and complying with the law. Right now we are calling all foreigners who entered the country before November 9, 2012 to come to the institute to make free process, "he said. He explained that, in some cases, foreigners enter legally, but because they are left to live and stay was determined by certain period, to leave the country does not change the status of such persons "illegal". Meanwhile, he said that there are about 27 Americans in California with legal status, which means, "to the Consulate General", the largest community that exists in the United States in Mexico, above Chapala, San Miguel de Allende or other tourist areas. De la Peña Angulo said that about 80 percent of the work is done INM in Los Cabos, where the largest number of foreigners are concentrated, although the area of ​​La Ventana and El Sargento, in La Paz, is where you have detected the Most illegal aliens working. humidity back up and like last year again. Oscoritos 2 ie O2 has a new fresh coat of paint being applied. As I mentioned they did some concrete work outside and these are now some nice covered concrete benches there. I will not take pictures of it so you can be pleasantly surprised when you return. other than that all quiet here, have not heard of the usual break ins that occur after people initially leave or thereafter..
humidity has dropped and temp has moved to normal. We had the election and the PAN won so there will be a change in office. The PRI are contesting the close results. The garbage men did not come for 3 weeks. Rumor is they were or are on strike. Same with the water department, heard the rumor they are on strike too. I believe they do turn the water on every once in a while. we had a sprinkling. appears only LaVentana and about 10 minutes. maybe 1/16 of an inch.